The 61st South Gloucestershire Regiment had been soldiering in India since 1845 and was stationed at Ferozepore when the Indian Mutiny erupted in May 1857. With Her Majesty’s 61st Regiment in Ferozepore were the 45th and 57th Native Infantry Regiments, the 10th Native Light Cavalry, and a European Light Field Artillery Battery. The two Native Infantry Regiments mutinied, and having failed to capture the magazine, which was defended and later blown up by the 61st, the 45th and half the 57th dispersed or marched away. One contingent of the 57th remained loyal but some of the captured mutineers were punished, two being hanged and twelve blown from the artillery’s guns. The key to British power in India was Delhi, which had been seized by the mutineers, and many European men, women and children living in the city were butchered to death. On 13th June over 400 men of the 61st led by Lieutenant-Colonel W.T. Jones left Ferozepore and marched for two weeks under a blazing sun the 250 miles to Delhi to join the growing army of British and loyal Indian troops surrounding the city’s walls. The mutineers made sortie after sortie against the besieging forces, one of the most serious being an attempt to capture or destroy the siege train which was coming up from Ferozepore. The 61st took part in the action, which was led by the ferocious John Nicholson, in saving the siege train at Najafgarh, and soon its heavy guns were in position and pounding the walls of Delhi. By 13th September two practicable breaches had been made in Delhi’s walls and the storm of the city began at dawn the following day; the fighting for the city continued for six days. The 61st were under the command of Lieutenant-Colonel Charles Deacon, Colonel Jones now leading one of the assault columns. “… Not a word was spoken, or a trigger pulled, until the stormers and the support had reached the summit of the breach and the magazine yard, when a cheer and a charge were given and made, on which the Enemy, taken most completely by surprise, fled precipitately, throwing down their port-fires at their guns. Several of them were bayonetted close to the breach, the others were closely pursued by H.M.’s 61st and the 4th Punjaub infantry. Delhi finally fell to the British on 19th September, a smouldering ruin as the victorious soldiers took their revenge and their officers dealt out summary justice. Reade later rose to become Surgeon General of the army in 1886. Following the capture of Lucknow in 1858, the mutiny fizzled out with the remaining rebels being hunted down over the next several months. The power of the East India Company was destroyed and British rule in India would never be the same again. The 61st returned to England in 1860, after an absence of seventeen years. 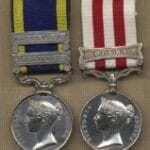 Picture: The medals of Colonel W.T. Jones, in the Soldiers of Gloucestershire Museum collection.